When I think of the drive-in, I always think about the scene from the movie Grease when Sandy and Danny get into a fight after he tries to cop a feel after giving him her class ring in the front seat of his car. When I think about Grease, I think about my best childhood friend Danielle and I watching the movie on repeat one summer and memorizing every sexually overt lyric and every suggestive dance move to all the songs in the film. Our parents never seemed to be bothered by the fact that we performed Grease concerts daily that summer, mimicking the characters in the film. I guess something about it taking place in the 1950's when everyone wore poodle skirts made inappropriate songs seem more okay? Anyway, that scene with Sandy and Danny is always what I thought of when I thought of a drive-in--teenaged boys in letterman jackets and girls in bobby socks "necking" in the back of '57 Chevys. I assumed that the drive-in was something that like sock-hops, had gone away over time. But thanks to Starlight Six Drive-In on Moreland Avenue, I learned that the drive-in is still very much alive and well. Day 286's thing I've never done before was to channel my inner-Pink Lady, and go to a movie at the drive-in. I knew ahead of time that my drive-in experience was not going to be like the scene in Grease. First of all, this was a group outing, so nobody was trying to get "fresh" with each other, at least not as far as I could tell. I mean, there were married couples there, so I suppose it's possible, but my friends Amy and Jeff had just completed a three-week cross country tour in a camper, so I think they were looking for some outside conversation, and since Emily and Scott had asked me to ride with them, I'm pretty sure they weren't looking to score either. At least I don't think. 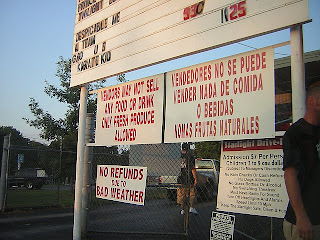 Not to mention, unlike the drive-in movies that I'd imagined, at this drive-in, we actually got out of the car to enjoy the movie. Most people around us did too. 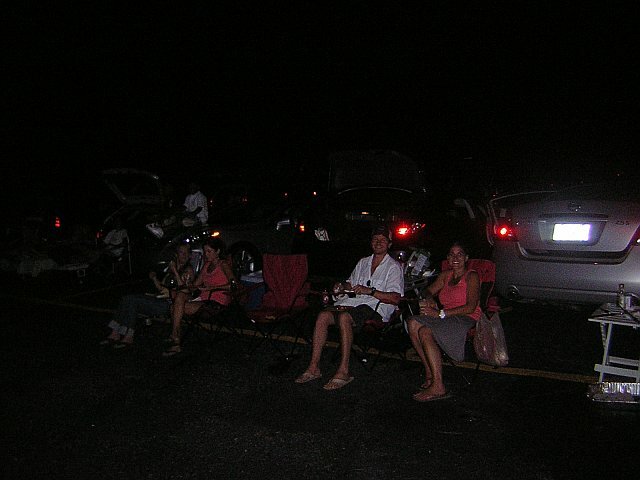 And for this group, the drive-in was more like a cook out, in an enormous parking lot, with dozens of strangers, where there just so happened to be movie playing on a big screen. So, yeah, not very Grease-like at all. But I was pumped, excited to be doing something different on a Saturday night, and very much looking forward to making my own drive-in experience. We went to the grocery store ahead of time in search of our bounty, which included chicken breasts, bagged salad, and ingredients to make cream cheese stuffed jalapeno peppers wrapped in bacon. Yes, you read that correctly. We (well, not me, but others) decided to cook chicken and bacon wrapped stuffed peppers on a homemade grill. In the parking lot. Of the drive-in. I marveled at my movie team's enthusiasm and decided that I, once again, have picked the right people to hang out with. I still can't decide if I am a lazy person, or if I have the most ambitious friends ever, but regardless, once again, the company I chose worked strongly in my favor. Had it been left up to me, we would've simply picked up sandwiches from a deli, and 40 oz. beers from a gas station, and been on our way. But if my super ambitious friends want to make a hot meal (appetizers included) on the grill and drink summer specialty brews, I have no choice but to support them. I assumed, incorrectly again, that the drive-in would show one film and we were at the mercy of whatever they were playing. But on the way there, I found out that not only do they have six screens to choose from (get it, Starlight Six? ), they also show two movies on each screen back to back. 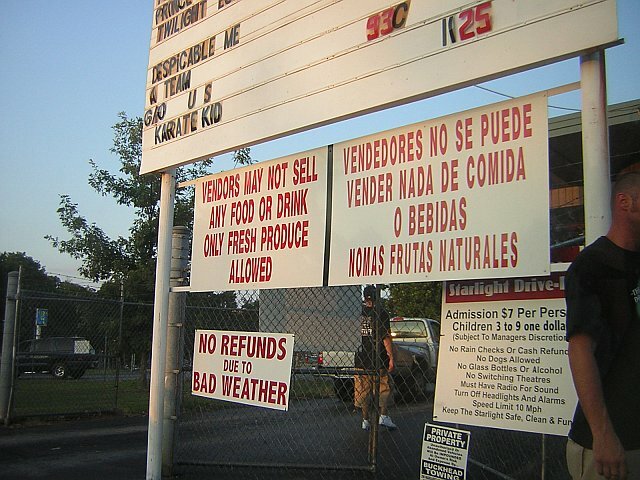 So for $7 a piece, we could drive our own cars, park directly in front, grill our own food, drink our own drinks (alcohol included) and see two movies in a row. Starlight Six Drive-in, then, has to be one of the best entertainment values in town. 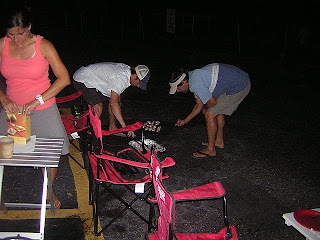 We pulled our cars in when it was still light outside and immediately the boys started getting to work assembling the grill (a disposable aluminum lasagna plate and a brought-from-home grill grate). Jeff began marinating the chicken, while Scott stuffed the peppers and wrapped them with bacon, securing them with a toothpick. Amy and Emily and I took a step back and let them do their thing. We looked at pictures from Amy and Jeff's cross-country adventure and sipped on brews. 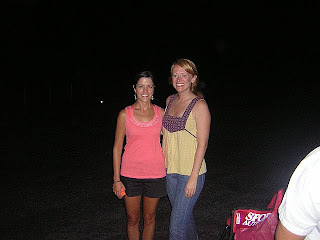 The crowd at the drive-in was extremely diverse. All ages, races, socio-economic statuses were represented. What seemed clear, and would remain pretty clear throughout both movie viewings, was that the tailgating and fellowship aspect of the drive-in was far more important than watching the film. This is probably why people talked throughout the movie and were constantly driving in and driving out while the films were in progress, sometimes driving right underneath the screen. We even had friends show up midway through the first movie, casually walking up to our cars with a cooler. When you're outside, under the stars, with your own food on the grill, the drive-in becomes more about that, and less about the cinematic experience. Not a problem for me, especially when the films we opted to see were the animated film Despicable Me and The A-Team. In our defense, there weren't a lot of great options out there at the time. But these were great for the drive-in. They were both entertaining, and not in need of serious attention. When the sun had started to set, Scott and Jeff fired up the grill, and began to cook our feast, starting first with the stuffed peppers. I was impressed that he attempted such an aggressive hordeourve, not so impressed with the peppers taking so long. I don't think that any of us really knew how much time grilling on a homemade grill would take. And before we knew it, before our meal was entirely cooked, the sun had set. One thing that is funny (or scary depending on how you look at it) about grilling our own food at the drive-in is that once the sun went down, despite the glow of the movie on the screen, we were unable to really see what we were eating, and therefore couldn't really tell whether or not it was fully cooked. We basically threw caution to the wind and went for it, convincing ourselves that as long as it looked, and tasted done, we were fine. And we were, though I'm not sure cooking and eating this way is the safest way to go. We all settled in with our plates full of delicious food and settled in for our first film, Pixar's Despicable Me, about a supervillian (Steve Carrell) who changes his ways after becoming an unlikely dad to three young girls. I loved it. So funny, so cute and sweet. I may have cried. No, I definitely cried. I honestly thought (and secretly hoped) that after the first movie, we would do what a lot of other cars were doing around us, and leave. But it became pretty clear that no one was going anywhere; they were all excited about watching the A-Team. So I sat back down in my chair and got ready for another feature film. I'm not sure if it was the hearty meal, or if I was tired from the icing the night before, or The A-Team is just a really bad movie, but I had a hard time staying awake to tell you what it's really about. I may have dozed off in my beach chair several times. Again, not very Grease-like and the farthest thing from cool that I can think of-falling asleep at the drive-in? But don't let my inability to stay awake fool you. The drive-in is a blast, and such a different, fun way to go to the movies. I will be back. 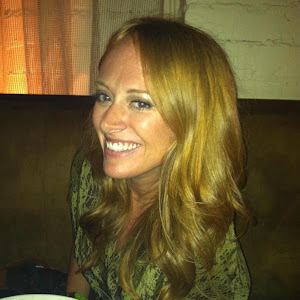 Day 287: They're Just O.K. Day 272: Oprah! Pick Me! I'm a Party!